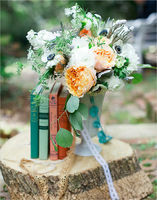 Cost: $10,000 // When two teachers fall in love their wedding is sure to be a bookworms dream! Book pages were strewn throughout Shelby and Ians Sunday brunch wedding from the book themed wedding invites, to the book page paper flowers in her bouquet and the thousands of book page paper pinwheels that decorated their wedding venue. See the wedding and budget breakdown here, photographed by KMI Photography. Cost: $6,000 You heard us right, 6 grand! Thats it! 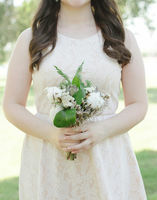 Plus this go getter bride pulled the whole thing together on her own in only three months! Holy smokes, are you impressed, because we certainly are! Sarah is one savvy lady who was able to design her own invites, arrange all of her own centerpieces including her beautiful bouquet and hand paint all of the wedding signage. See the wedding and budget breakdown here, photographed by Sawyer Baird. Cost: $10,000 Not only did this LA couple pull off an amazing wedding for under 10K but they did it on the sunny shores of Mexico! 30 guests attended their traditional lasso ceremony, followed by fresh seafood, incredible Mexican dishes, and plenty of dancing. The vibrant colors and laid back atmosphere reflected Rhea & Rio perfectly. See more of the wedding here, photographed by Marissa Maharaj, and of course see the budget breakdown here. Cost: $10,000 Shanna and Chance tied the knot in simple church wedding ceremony, followed by a dessert reception at the Louise Hopkins Underwood Center for the Arts Ice House. From the cotton and succulents used in the bouquets to a homemade cross used in the ceremony all to the way to the rosemary toss as the bride and groom exited the reception, this wedding was all about the personal touches. See the wedding and budget breakdown here, photographed by Jordan Washer Photography. Cost: $5,000 Elisabeth and Jeshua wanted a stress-free wedding that focused on the most important wedding day detail: the vows. They felt that an intimate wedding with very few close friends and family at the beautiful Columbia Gorge (where they met) was the perfect way to say I do. See the wedding and budget breakdown here, photographed by Ashley Forrette Photography. Cost: $7,000 Under 7 grand?! You bet! 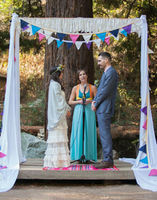 This spunky bride DIY-ed her way into a gorgeous day that was filled with fabulous ideas and wonderful memories; the only thing it was lacking was whopping price tag! Mindy and Alex were able to transform her parents backyard into a charming wedding wonderland without the restrictions that a public venue would have. See the wedding and budget breakdown here, photographed by Rachel Solomon. Cost: $10,000 Not only are they both artists, but they are both very free spirits that didnt want to be defined by typical wedding traditions. Garrett used his eye for design and created all of the wedding stationery while Ellie gathered all of the flowers from the L.A. flower district and put together her own floral crown, her bouquet, and all of the centerpieces. 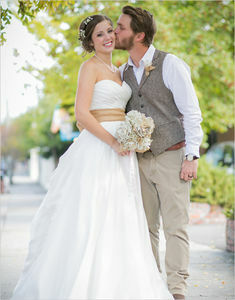 See the wedding and budget breakdown here, photographed by D. Lillian Photography. 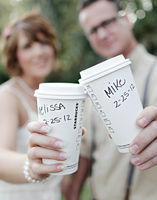 Cost: $5,000 We consume our fair share of coffee and more then likely so do you so it only stands to reason that this coffee themed wedding will be loved by all! 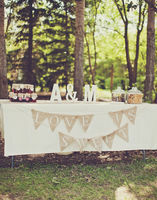 Perhaps the best thing about this lil' wedding is that they had it at their own home. I look out my back window and begin to giggle with memories, says Melissa, who adds that having a small wedding was the "best decision" she made. 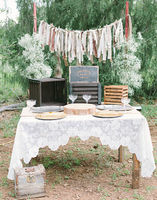 See more of the wedding here, photographed by Traci Giles Photography, and view the budget breakdown here. Cost: $5,000 Smores, homemade pies and jam, a campfire, fireworks  and kittens. Yes, kittens! What is not to love about this 5K, at-home wedding? Melissa and Adam wanted to feel comfortable on their wedding day; being the center of attention in front of a big crowd was not their idea of a good time. The solution? A backyard wedding with their closest friends and family. See the wedding and the budget breakdown here, photographed by Jesslaine Elise Photography. Cost: 5K. 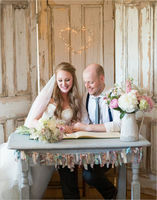 Sarah and Chris wanted their wedding to be the perfect reflection of their love: creative, artistic and special with touches of vintage and eclectic charm. They brought together an intimate gathering of friends and family from all over the world; Chris side from the UK, and Sarahs side from Canada and South Africa. See the wedding and budget breakdown here, photographed by Christie Graham Photography.